Need some last-minute burger ideas for Memorial Day? 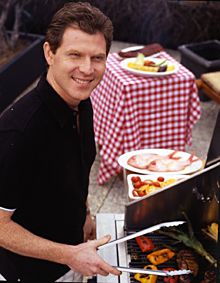 Here's a quick suggestion from celebrity chef and grilling expert Bobby Flay: Pimento cheeseburgers. To make them, mix grated cheddar cheese with chopped roasted red pepper, mayonnaise, cayenne pepper, and salt and pepper to taste, then let the cheese melt into a patty that's fresh off the grill. "That's all pimento cheese is," he said. Flay, a well-known host of his own Food Network shows as well as a judge on America's Next Great Restaurant and Food Network Star, is planning a low-key Memorial Day celebration with his wife, actress Stephanie March of Law & Order: SVU. It'll be a day to take time off from his many restaurant ventures, one of which is a new Bobby's Burger Palace chain opening in College Park, MD later this year. In a recent interview with SpeakEasy, Flay also expressed that he's looking forward to working more with Giada De Laurentiis, who will be a new judge on this season's Food Network Star. "I think it’s going to be good since I was the only person on the panel who was from the talent side. Plus, it’s always nice to have another woman’s touch. It kind of balances things out," he said. And as far as what foods to stay away from this holiday, Flay remembered one of the worst meals he's ever eaten. "Probably something I got food poisoning from. It was a soft-shell crab dish. But it hasn’t stopped me from eating soft-shell crabs again," he added. "Food poisoning doesn’t scare me." Season 7 of Food Network Star premieres Sunday, June 5 at 9 p.m. EST.